DEBORAH CROMBIE: I've had such fun this week, talking about some of my favorite books and authors. And now I have one more, my friend Tony Broadbent. SHADOWS IN THE SMOKE is the third book in his In the Smoke series, set in late 1940s London, and featuring dashing Cockney cat burglar, Jethro. You might guess how much I like Tony's books by the fact that that's my quote on the cover (Squint really hard...) What you can't see is that I'm in very good company--the blurbs on the back jacket are from Michael Connolly, Lee Child, and Jacqueline Winspear! (I'm hugely flattered to have got the front!) I'll let Tony tell you more. TONY BROADBENT:Your blurb describes our Jethro to a T: ‘A rakish Cockney cat burglar with the soul of a poet.’ Lovely stuff. Thanks ever so. Jethro is based on the father of an old friend of mine­­­—who I never ever met—but who was an honest to goodness cat burglar in and around London. And as my ‘old china’ (Cockney rhyming slang: old china = old china plate = mate) had a career in the London theatre, I put the two together and ‘voila’—our Jethro. DEBS: And the time period is so fascinating. London in the late forties is The Smoke. A tough place, filled with bombsites, still in the throes of austerity. The gangsters were not to be trifled with (the next decade would see the rise of the Kray twins) but Jethro, who may be a creeper (cat burglar) but is as honorable as they come, always seems to get on their bad side. But that London had its charms as well, and a thriving vitality. When I read your Jethro books, every detail is so perfect I feel as if I’m there. How do you get that authenticity? TONY: That London of bombsites was there well into the Sixties—and when I was nipper—a very young kid—my father would always take me up to London—for the fun of it. So I actually visited many of the areas I write about—Church Street and Petticoat Lane (street markets) in particular—and actually saw Jack Spot—‘Spottsy’—one of the Lords of The Underworld—on Church Street. (I wasn’t half as impressed as I was when I bumped into and met the famous American cowboy star—Tex Ritter—at the Wembley Arena for his Wild West Show—and he tousled my hair and said “Howdy pardner”. I blush to think that I must’ve been in full cowboy regalia myself. But all part of the fun. And different times, maybe, but heroes are ever important. And our ‘body memories’—sights, sounds, smells—of time and place never really go away. All it needs is a few nice, old black and white photographs to bring it all back. The details—come from reading all manner of things—autobiographies of stage star and crime star and ex-Scotland Yard coppers—newsreel, newspapers—anything and everything. DEBS: I think it’s quite a challenge to write long and complex novels in the first person, but you do it very well and I think that’s part of what gives the Jethro books such a sense of immediacy. Was that a conscious decision? Does the line ever blur between Tony and Jethro? TONY: The challenge in writing, of course, is to try keep your head on straight—and only ever revealing what Jethro would actually know at any one time. I’ve tried all manner of different ‘work-arounds’ to the problem—and some have succeeded more than others. 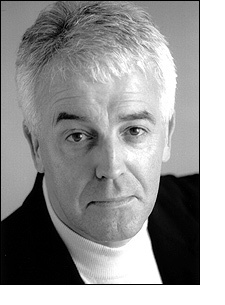 And as for ‘keeping my head on straight’ with the character of our Jethro. In my head, I always give him the voice of the young Michael Caine—a great British actor— a man of humanity and humor—born and bred in London—the youngsters out there will know him as Alfred the butler in the latest ‘Dark Knight Rises’ film trilogy starring Christian Bale as the caped crusader. (Again—our heroes are ever important—regardless of how they might kit themselves out.) All I have to do is read some lines of narrative in Michael Caine’s (younger, Cockney) voice and I’m away and running, so to speak. As for the line blurring—how can it not? That’s why I introduced other ‘pop’ heroes of mine into the narratives—the author, Ian Fleming; the actor David Niven; even the extraordinarily talented Michael Bentin—one of the originators (along with Peter Sellers, Spike Milligan, and Harry Secombe) of the ‘national obsession’ BBC radio comedy show in 1950s Britain—‘The Goon Show’. And so—yes—when’s all said and done, I just try conjure up the dark streets and alleyways of the London of the late Forties and early Fifties—and I’m away and running, itching to climb the nearest drainpipe, up and onto the rooftops—an eye open for any open windows of interest. DEBS: I'm going to hunt for a copy of To Catch a Thief, and a few Michael Caine movies, all the better to imagine Jethro. Readers, SHADOWS isn't out until October 16th, but the first two books in the series, THE SMOKE, and SPECTRES IN THE SMOKE, are available in trade paper and as e-books. So if you haven't made Jethro's acquaintance, here's your chance to catch up. "I went upstairs to have a look at my wife and couldn't believe my eyes." 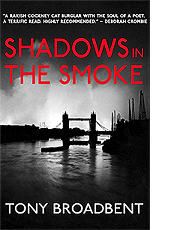 And Tony will give an ARC of SHADOWS IN THE SMOKE to the reader who can tell us what nickname Jethro gives to the CIA agent James Russell in SPECTRES IN THE SMOKE. Tony will be checking in today to respond to questions and comments, so do drop in and say "hi." He can also be found at www.tonybroadbent.com, on Facebook, and on Twitter. One last bit of Jungle Red business: Thanks to everyone who came to Lucy's party yesterday. Dee (Gram) is the winner of the Keys Cuisine cookbook and Amy is the winner of DEATH IN FOUR COURSES. Please email LucyBurdette at gmail dot com to arrange delivery. I threw some pears to get a butcher's hook at the old china and couldn't stand the flies. Huh? Sounds like a great series Tony. Oh dear! Another series to add to my TBR list. I love it! Thank you, Tony, for joining Jungle Reds. How can we not love something Deborah Crombie recommends?! I am a huge "To Catch A Thief" fan, and Jethro sounds like someone I'll enjoy getting to know. Thanks, Debs, for adding another author to my "gotta try" list! Shadows in the Smoke comes with a map of Jethro's London, which I love. Tony, I haven't read "Spectre in the Smoke" -- but all three of your Jethro books just went onto my TBR list. Between this interview and Deborah Crombie's recommendation, I am definitely intrigued! A wild guess: would the nickname in question rhyme with "spook"? Oh, and I forgot to say that I loved your story in "A AStudy in Sherlock"! Welcome, Tony! I hadn't been aware of the SMOKE books, so I'll remedy that right away. As Marianne said, "How can we not love something Deborah Crombie recommends?!" On another note, got my copy of THE OTHER WOMAN and immediately read the whole thing last night. (It's why I'm yawning this morning.) SOOOO very good! Yay, Hank!! Tony Cariad--how lovely to find you on today's Jungle Red, and many congratulations on the new Jethro book! I believe my father went to that same Wild West show at Wembley and brought me home autographs from people who did remarkable things with rope. Wish you best of luck with the book. He's got a nice video under the About Tony section. Almost as good as meeting Tony in person. Hi, Tony! Michael Caine! Perfect casting... but too old. How about Benedict Cumberbatch? Yes, your books are reminiscent of To Catch a Thief. Also of the wonderful (though thoroughly American) Donald Westlake's Dortmunder novels. Good Morning Jungle Red Writers - Blimey - what a fabulous gathering of writing talent - I swoon at the thought I know three of the leading ladies enough to call friend - the others by their sterling reputations. As for the background to Shadows in the title: Shadows In The Smoke. There was a huge surge in crime in postwar Britain - especially in London and the surrounding Home Counties. Some of them joined the big established London gangs - most made themselves available for hire when a gangster - working once or twice removed from a crime boss or shady 'legitimate' businessman put a gang of criminals together for a specific job. To battle this - the Assistant Police Commissioner (C Division) at Scotland Yard came up with the idea of putting together a group of undercover policemen and women - new faces unknown to London's criminals - from around the country and the rest of the commonwealth. The mission of this Special Duty Squad was for them to ferret themselves into London's Underworld - into the clubs, pubs, bars, spielers, gyms frequented by London's top villains - for them even to join gangs if necessary. And then to report back via a secret telephone control centre at Scotland Yard. The detectives at the nerve centre at Scotland Yard were hand picked - very few in number - had their own 'locked' office to keep their operations away from any 'bent' coppers on the pay roles of the big London crime lords. The national newspapers quickly dubbed the group: The Ghost Squad. London's villains called them The Shadow Mob - and put a price on each of the heads of the Squad's undercover operatives - if they could ever find and identify them. Blimey - and that's just part of what Shadows refers to in the title. Hope this isn't over the top. PS Bore da - Rhys Cariad - thanks for your lovely welcome. PPS We - faculty and fans - were all the poorer for you both not being there. So interesting, Tony. I just read The Yard by Alex Grecian, which centers around the development of the first Scotland Yard murder squad in the 1890s. And what Jethro is up to next. Any hints for us? Love your linking of Donald Westlake's Dortmunder and David Dodge's (and Cary Grant's) John Robie. As for Benedict Cumberbatch? His role as a modern Holmes in the BBC's exemplary - brilliant - 'Sherlock' will I believe turn out to be the defining role of his lifetime. His plus-perfect 'double' casting with Martin Freeman as has Watson - is quite unbeatable. And I speak as someone for whom the incomparable Jeremy Brett will always and forever be the (classic) Holmes - certainly for my lifetime. isn't it amazing what the right casting will do for a role. The 'truth' of it becomes universal and iconic. There's a story that George Raft was first offered the part of Rick Blaine in Casablanca. How fortunate for us all that he turned it down. Thanks for inviting me to your party in the jungle. Nice place you have here. As to your question as about what happens / eventually happened to the Ghost Squad — I, of course, have my theories — but the official Scotland Yard version as to what supposedly occurred is referenced at the end of Shadows In The Smoke. And as for Jethro’s next ‘creeping narrative’ … It’s called Skylon In The Smoke … it follows hard on from events in Shadows … sees the start of a power shift in London’s Underworld … witnesses the Festival of Britain … even touches MI5 and the emerging murky world of postwar atomic spies … and all before Jethro even has time to put on his turtles. (more Cockney rhyming slang: turtles = turtledoves = gloves). OH, rats, Im now obsessed with figuring out the cockney slang. Which I have no idea.. I went up the bears to get a book at my louse, and couldn't believe the lies? I went up the apples and pears to have a butcher's hook at my trouble and strife and couldn't believe my....oh I don't know. Meat Pies? Anyway, this series sounds right up my alley. Oh, who'd have thought it, having to explain that Michael Caine was once young! Good for you, Hank! I'm going to have a go at the end of the day, even though I'm not eligible for the book. The fun thing about rhyming slang is that is keeps evolving. As in Barak Obamas--Pajamas. But 'A Bird Named Hank.'? And a double knockout - at that. What's not to love about this lovely country? ... or Jungle Red Writers? As for the everyday pursuit of Cockney slang / London Underworld slang / and (in Shadows) Polari - the traditional slang used by theatricals and those of the Lavender Persuasion (as they sometimes referred to themselves) ... there's a helpful & fun glossary that comes free - inside each and every In The Smoke novel. Simply glance through it a couple of times - and you'll be able to impress all the other guests at the next dinner party you go to with your amazing dexterity in Cockney Rhyming Slang & Back Slang. "I threw some pears to get a butcher's hook at the old china and couldn't stand the flies." Awful Cockney slang - but great American literature in miniature - Stephen King / Elmore Leonard / Carl Hiaasen out of Hemingway - and by the look of it - you could be out on that Marlin boat before the rest of us could finish our Mojitos. And if you're not already writing - you should be - that's a hell of a logline for a novel. Lovely of you to comment – Lark. Thanks for that. Hopefully – TBR doesn’t stand for TonyBroadbentRemaindered? Anyway – as for ‘spook’ being the nickname in question – nice try – but no cigar – not even a CIA ‘007’ & ‘Spectre’-inspired’ exploding one. (You do know that was one of the methods of assassinating Fidel Castro the CIA seriously considered employing following the Bay of Pigs debacle?). A reader on my Facebook page mentioned Michael Caine's Gambit. Now that was a fun one--we may all be spending the weekend watching Cary Grant and Michael Caine! Okay,Tony, it's the end of the day ad I have a few cups of caffeine in me. I am STILL trying to come up with at least a not too embarrassing entry..maybe after dinner. The little ol'grey cells have gotten a workout! I notice I've been writing 'Hollie' not 'Hallie' throughout the entire day - a speed-typing multi-repeat idiotic mistake - either that or I must have Christmas already on my mind - though truth be told - there is an important character with the name Hollie in the story I'm currently working on. Anyway - what on earth can I do to make amends? A glass of your favorite shampoo, perhaps? A glass of your favorite champagne? All the very best - Ho...Hallie! Ho, Tiny! Want to give a clue of the spook question? What a delight to 'meet' you Tony. Having read and thoroughly enjoyed The Smoke (which I discovered through Maggie Topkis's fabulous Felony and Mayhem site), I'm looking forward to following Jethro's further adventures. I may be a lifelong Californian, but I adore all things British, and you certainly give a sense of time, place and atmosphere. Irresistible. Let me see now... mmm? PS If I could show you a picture of the man in question (sans hat) you'd get it in an instant. You mention the fearless, fabulous Maggie Topkis of Felony & Mayhem - and the wonderful Partners In Crime Bookstore - a truly great Indie Press - keeper of so many mystery-literary flames. I owe a lot to Maggie - she kept Jethro published when he slipped out the window of the Flatiron building and ventured forth into the Village - a great base for a little bit of burglary on the Upper East Side (in Jethro's world this all took place in the mid-Thirties / in mine, in the mid-2000s). All of which is to say - thanks ever so for venturing into The Smoke. (The Smoke, of course, being Cockney for London Town throughout Victorian times - in the same way that New Yorkers refer to their own home town as the Big Apple). Thanks again Lynda - hope you enjoy Spectres and Shadows.